There is a lot of back and forth on whether people should take a multivitamin or not, so it’s no wonder many of us are confused. With this article, I’ve sought out to clear up some of the confusion and bust some myths so you can make a more education decision on your health. Keep reading to find out how to choose the right multivitamin. Although many critics of multivitamins claim that we can get all necessary vitamins from food, it’s actually quite difficult to do so unless you’re eating the perfect variety of farm fresh foods grown in perfect nutrient rich soil along with pasture raised meats. If you know anything about the state of our food system, you know that is nearly impossible. Don’t We Get Enough Vitamins from Foods? Unfortunately, over the past few decades soil degradation as a result of monoculture, factory farming, chemical pesticides and fertilizers have depleted many nutrients from our soil. So the dirt that your plants are grown in is not the same nutrient rich soil that it was even 50 years ago. In fact, many farmers have to put artificial nutrients back into the soil in order for things to grow. Because of this, plants grown in that soil don’t necessarily have all the nutrients they are supposed to. Studies have found that vitamin and mineral deficiencies are on the rise because they’re not as readily available from food sources. Furthermore, the longer a plant has been out of the ground, the fewer nutrients it has. So if you buy food from the grocery store chances are it travelled pretty far to get there and over time lost quite a few of the nutrients. That’s not to say that food doesn’t provide vitamins and minerals, it certainly does and it’s of vital importance to get MOST vitamins and minerals from food, but because of the state of our modern food system it’s nearly impossible to get ALL necessary nutrients from food, so that’s why multivitamins are like an excellent insurance policy for your health! What Happens When You Don’t Get Enough Vitamins? Some people think that if they were deficient in certain vitamins they would know because they might drop dead or have some serious health issue, but most of the time vitamin deficiencies can cause smaller issues that you aren’t even aware of being related to a lack of vitamins or minerals. For example, many years ago I was vegetarian (I’ve since stopped being vegetarian because of nutrient deficiencies. You can read more about it here). Early on I noticed that I would have issues with severe hunger right after eating a full breakfast. 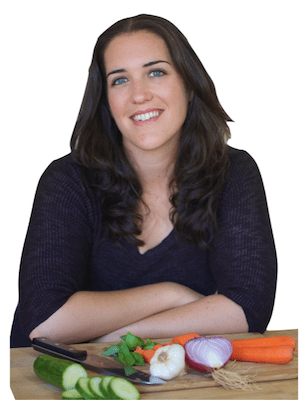 I talked to a nutritionist and she suggested it may be related to b12 deficiency. Lo and behold, I began taking a B supplement and the hunger after breakfast went away! Crazy to think that an issue like that would be related to vitamin deficiency, right? Other issues like sleeping problems can be related to vitamin or mineral deficiencies. 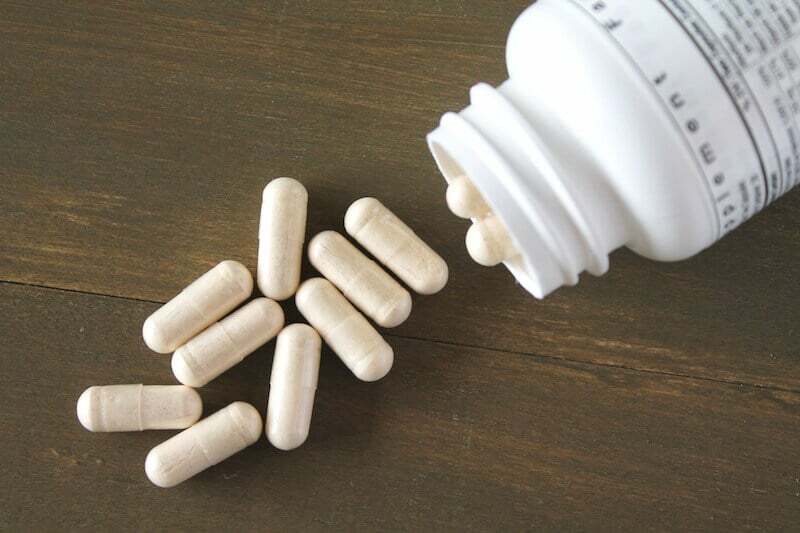 Many people find relief from sleeping problems after taking a magnesium supplement in the evening. Many people with hormonal issues like hypothyroidism, hashimoto’s or adrenal fatigue are lacking in Vitamin D and find that their symptoms improve after adding some in supplement form. So, you probably won’t die from a minor vitamin deficiency, but you may be just a vitamin away from better sleep, mood or energy. This is why taking a multivitamin as a sort of basic way to cover your bases is a great idea. Does Your Body Even Absorb Vitamins? You may have heard that multivitamins are a waste because your body doesn’t absorb them and you end up peeing out most of the vitamins anyway. So, is this true?? Yes, it is actually true that some vitamins can be excreted through urination. What many people don’t know is that there are different forms of the same vitamins and some forms are more easily absorbed by the body than others. For example, Vitamin B9 can be in the form of Folic Acid or Folate. Folic acid is a synthetic form of the vitamin and is difficult for the body to recognize and process and unfortunately can cause a build up and lead to further issues. On the other hand, Folate is the natural form of B9 and is more readily absorbed by the body and doesn’t have the risks that Folic Acid build up does. 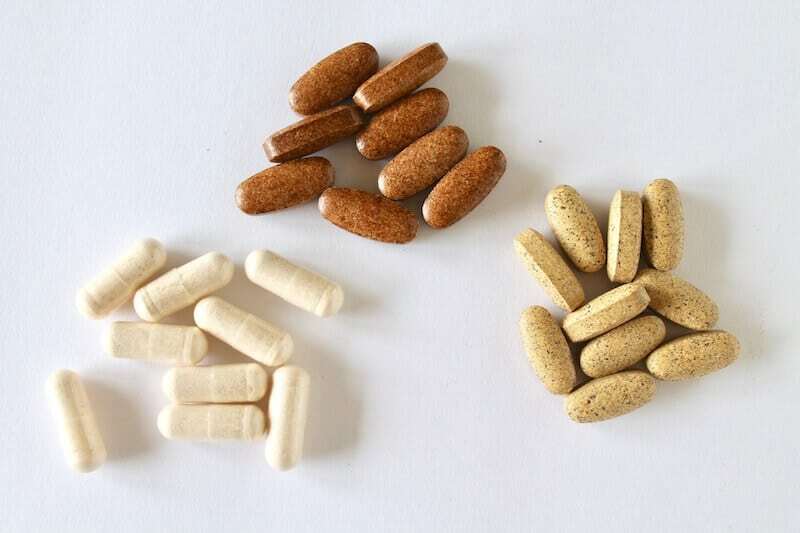 While it is true that some vitamins can just be excreted through urination, we also know that other sources of vitamins have better bioavailability (they are readily absorbed by the body). So it’s important to get the vitamin forms that are more easily absorbed. How Can You Ensure You Get A Multivitamin That Gets Absorbed? When shopping for a multivitamin you want to make sure you get the right forms of vitamins. You’ll want non-synthetic forms of vitamins. Many of the cheaper store bought brands of vitamins are just filled with synthetic forms and don’t get absorbed very well, so they just end up being a waste. One of the most important things I look for when I look at the list of vitamins on the bottle is whether it has folate or folic acid. I’m looking for folate NOT folic acid. Like I previously mentioned, folic acid is the synthetic form of the vitamin and is not easily absorbed by the body while folate is the natural form and is more bioavailable. Folic acid can also cause issues if it builds up in the body without being absorbed–this can be especially problematic if you have the MTHFR gene mutation which is being discovered as more and more common for many people. This is also really important for pre-natal vitamins…many pregnant women are recommended to take folic acid which can sometimes do more harm than good. Folate is the way to go. If you do have the MTHFR gene or even if you’re not sure, it’s best to try to get methylated forms of vitamins like folate in the form of L-5-Methyltetrahydrofolate and b12 in the form of Methylcobalamin since they are better absorbed. This is a good brand that uses methylated vitamins. Food based multivitamins are a great way to make sure you’re not consuming synthetic vitamins which can often do more harm than good. Food based multi’s literally have food in them like fruits, veggies and spices which is where the vitamins come from. You body also absorbs vitamins better when they are taken along with a food source for that vitamin, so a food-based multi will take care of that for you. In addition, the fact that there is already food in the vitamin helps you digest the vitamin better and not cause the tale tell nausea and stomach issues that often comes with taking synthetic vitamins on an empty stomach. Many people report even being able to take food based vitamins with an empty stomach (however, I would still recommend having it with a meal). 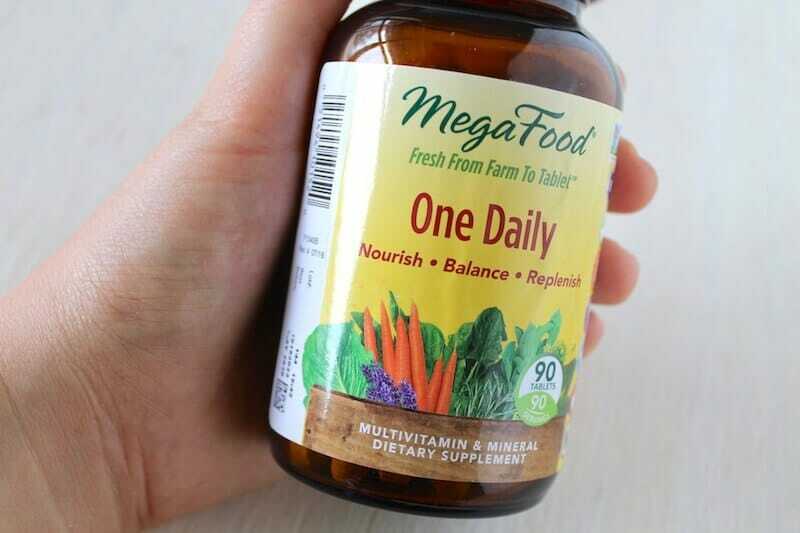 There are a few good food-based multivitamins that I recommend (like this one). However, there are also good multivitamin options that are not food-based, but you should ensure that you take these with a meal. 3. Make Sure Your Multi doesn’t have scary additives! Many people are surprised to find that many vitamins are extracted from genetically modified foods like corn and soy. Apart from the issues with corn and soy being high in inflammatory omega-6 polyunsaturated oils, GMOs have been known to cause digestive issues and possibly even more serious health effects. Choosing a multivitamin that is non-GMO is a good way to ensure that it is as clean as can be. Obviously if you have an allergy or sensitivity to soy, gluten or dairy, you’ll want to avoid any vitamins that have this as an additive as well, but there’s also a case for all of us to avoid these items in our vitamins. Soy is high in omega-6 polyunsaturated oils which is associated with inflammation. Dairy and gluten can also be hard for the gut to digest, so it’s best not to have these additives in your vitamins. With so much criteria out there for choosing the right multivitamin, it can be a little confusing to know which brands are good and which are not so good. I’ve created a list of some trusted brands below. 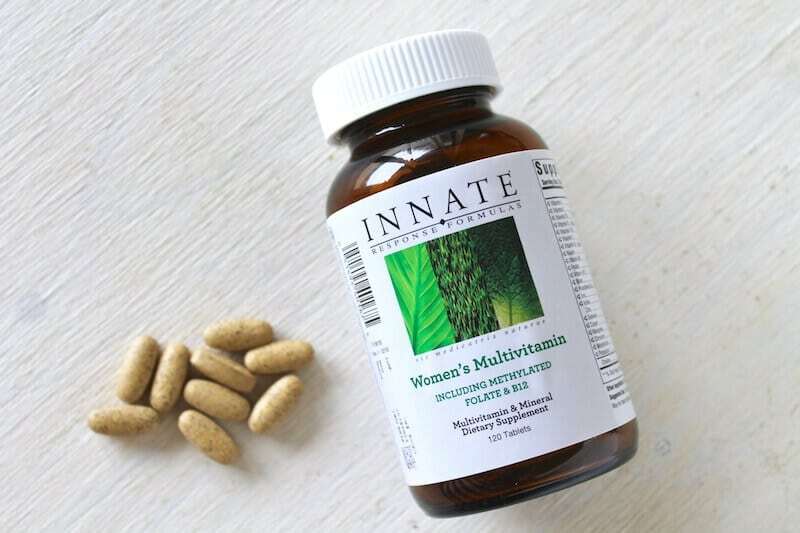 I got my multivitamins through iHerb.com. They have a HUGE selection of quality vitamins and supplements at a really affordable price. Plus shipping is free for any order over $20 and my order came super quickly! Easy peasy right? 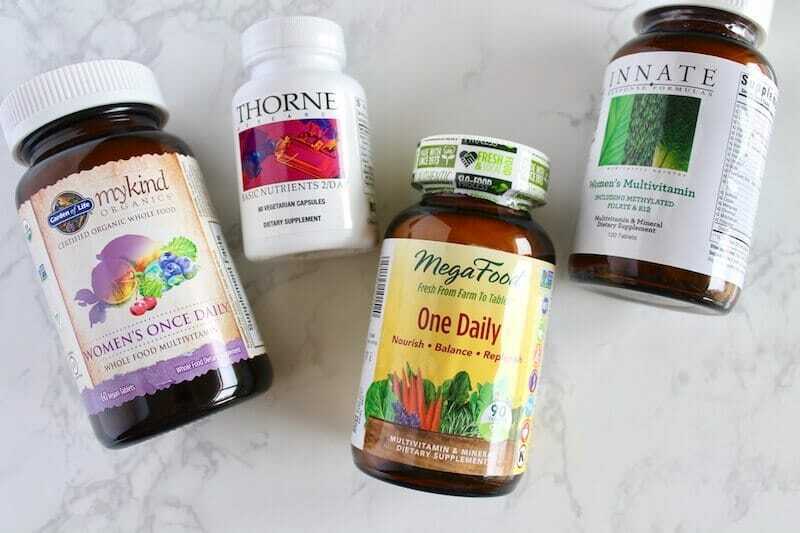 All of the following multivitamins fit most or all of the above criteria and are available to purchase through iHerb (get 5% off here). Some are food based and some are not, but they are all good forms of vitamins that are more easily absorbed! This one is not food based so be sure to take it with a meal. 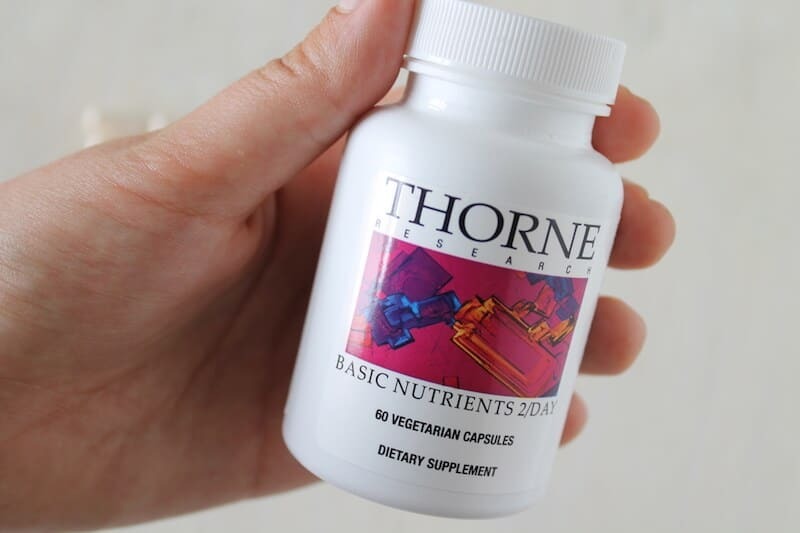 Thorne is a great company that usually has the right forms of vitamins and minerals in their supplements to ensure better absorption. If you look at the bottle, it includes non-synthetic and methylated forms of vitamins to ensure the best bioavailability. This is the one I usually take. It was recommended to me by my trusted nutritionist! Get it here. This is a food based vitamin and also includes methylated folate and b12, so it’s a real winner! This is a brand that I just discovered on iHerb, but it looks like one of the best of the bunch! I got the Women’s multivitamin, but there are also ones for Men and ages 55+. Get it here. This is another food based multi that can easily be taken on an empty stomach. It is non-GMO, soy free, pesticide free and dairy free. I just got the general one daily multi, but iHerb also offers MegaFood multivitamins specific for men, women, prenatal, kids and ages 55+. Get it here. I love that this food based multivitamin is organic. After all, if you’re going to have food in your vitamin, you would want it to be free of pesticides right? This one also has methylated b12 and folate. 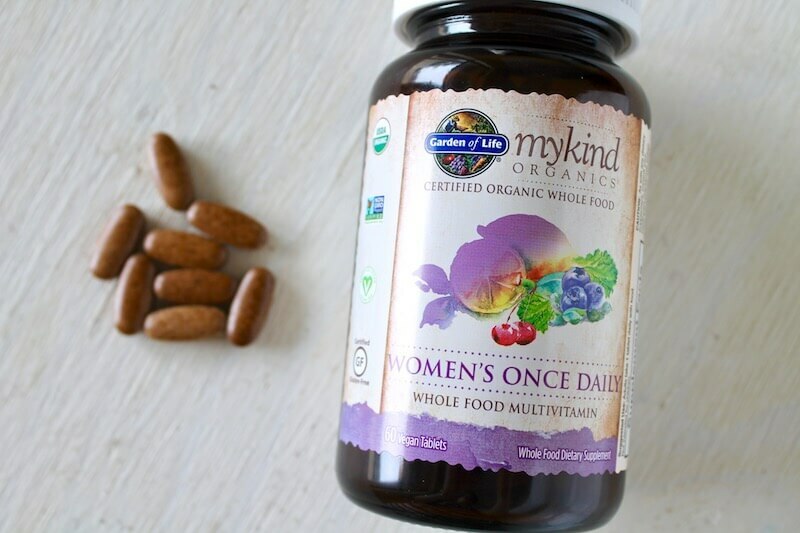 I got the Women’s once daily from iHerb, but there are also varieties for men, prenatal, kids and ages 40+. Get it here. Enjoy $5 OFF PLUS 5% OFF of your order on iHerb.com! Luckily all of these high quality multivitamins are available at an affordable price on iHerb.com. 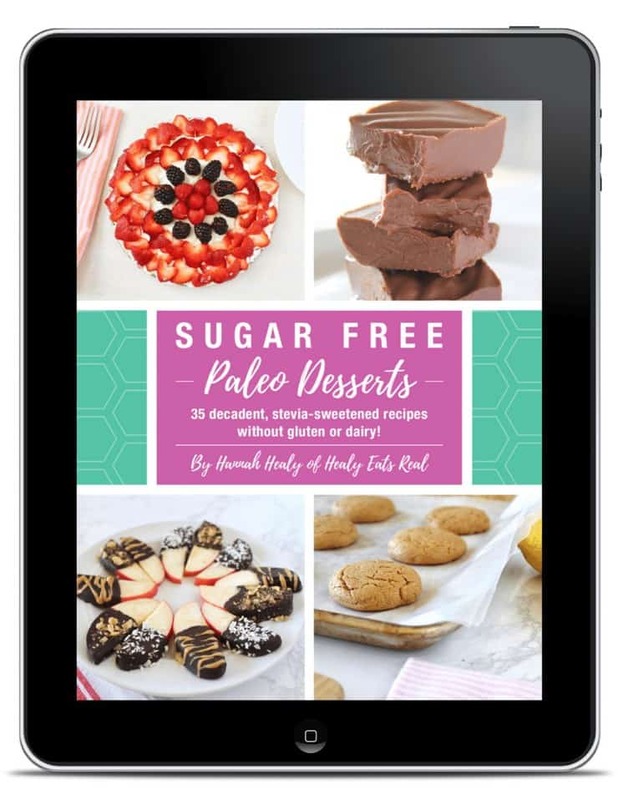 But it’s even better that iHerb has offered Healy Eats Real readers 5% OFF of your order plus $5 OFF of new customers’ first order over $40! So stock up on these high quality multivitamins at iHerb. Click here for 5% OFF Your order at iHerb + $5 OFF new customers’ first order over $40! *Note: When you use my link above, both discounts should be automatically applied to your cart, but if you have any trouble you can use code IHERBNEW5 for $5 off for new customer orders over $40 and code NAH6634 for 5% off for all customers. This is a sponsored conversation written by me on behalf of iHerb.com. The opinions and text are all mine. Thanks for this valuable information and tips about multivitamins. This is really helpful advice! There is so much to vitamins and making sure you are choosing the ones that are right for you. Good tips here.